ClipCache Pro will make sure that you never lose another address, phone number, or other important bit of data again. 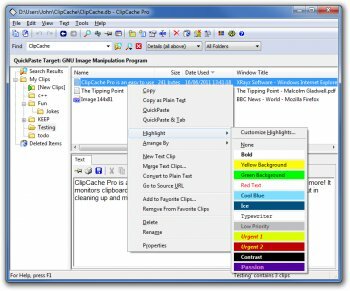 This powerful, easy-to-use clipboard enhancement tool sits quietly in the system tray monitoring all clipboard activity. Text can be instantly edited on the spot using any of the many handy cleanup functions available, such as removal of the annoying ">>>>>" from emails which have been forwarded too many times, removal of large gaps and white space from emails or web table pasteups, removal of linebreaks and dozens of other marvelous features. Best of its kind. I have tried all clipboard extension software. The true is that clipmate offers some additional features but it is and feels huge and not so responsive. Only feature that I miss is spell check. Best and fast usage. I like right click tray icon and choose. It's very fast. I tried version 2.x of ClipCache Plus several times, and while I liked it, something was always lacking or problematic. But ClipCache Pro is brilliant! It's fast, it's powerful, it's flexible. The Recent Clip List and ClipMenu features are nice, and both can be assigned to hotkeys. I'm a long-time user of ClipMate, which is pretty good too, but it has been crashing on me relatively frequently for a long time. Not anymore--goodbye ClipMate, hello ClipCache Pro. ClipCache Pro is also much faster than ClipMate on my system. It launches much more quickly, and when I press the hotkey to make the main window appear, it appears instantly. ClipMate would sometimes take a couple seconds to appear (mainly the first time it was displayed), and always had an annoying display lag after that. BTW, I'm using ClipCache Pro 3.1.1, which is newer than the one posted here at the moment. I didn't realize I needed a clip manager until someone suggest ClipCache to me. One word — WOW! XRayz Software (http://www.xrayz.co.uk/) has thought of almost everything in this app, including customizable keyboard shortcuts. All around, ClipCache will impress you. a godsend app, the best of the lot ! !,well worth the cash.. I use this program for everything that I do. It has a great list of features, including the ability to manipulate the text strings that are in your clipcache. Very nice interface. And easy to customize to what you want. The support is good as well, they do return mail quickly on questions you may have about the product. They are also willing to listen to ideas that you may have to improve the product. The only thing I am praying for in the next major release will be network support. I would love to be able to clip from machine to machine easily :)..